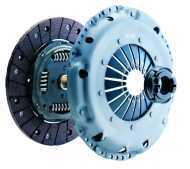 If you get hold of a BMW V8 manual gearbox then you'll also want the E34 V8 manual flywheel and clutch. Finding a complete manual 530/540i to take the engine & box from would be ideal. The E34 530i used a 240mm clutch, and the E34 540i used a larger 265mm clutch. Later E39 540i models went back to using the smaller 240mm design. I decided to use a Ford V6/Cosworth pattern 240mm clutch because i didn't have a manual BMW flywheel or clutch to begin with, so i chose a clutch pattern that was universally available and had upgraded parts available. Also it fitted with spline pattern on the Ford gearbox i used. The paddle plate i'm using doesn't have a sprung centre, and i'd read that these will judder a lot for everyday driving. The only time i've noticed the judder is when you have to feather the clutch a lot, like pulling out of a tight parking space on a steep hill or creeping in slow traffic up a steep hill. Apart from these situations it drives like a normal clutch. A new 32x15x9 ball-bearing was fitted in the back of the crank to take the Ford input shaft. The hole in the crank is far too big for the Ford input shaft so it needs the right sized bearing to stop the end of the input shaft floating around.